Two subjects arise in any conversation about the glass-encased condo near the top of Portland’s John Ross skyscraper overlooking the Willamette River: The view and the price. First, it’s impossible to ignore the water and mountain views at 3601 SW River Pkwy#2905. The elliptical-shaped floor plan, like the other units in the 32-story building, maximize lookout opportunities. Then there’s the price for the luxury aerie, which was put on the market June 21 and remains the most expensive of the building’s units for sale: $2.35 million. Asking more than triple the purchase price seven years ago, the sellers prove that it pays to wait out a recession. 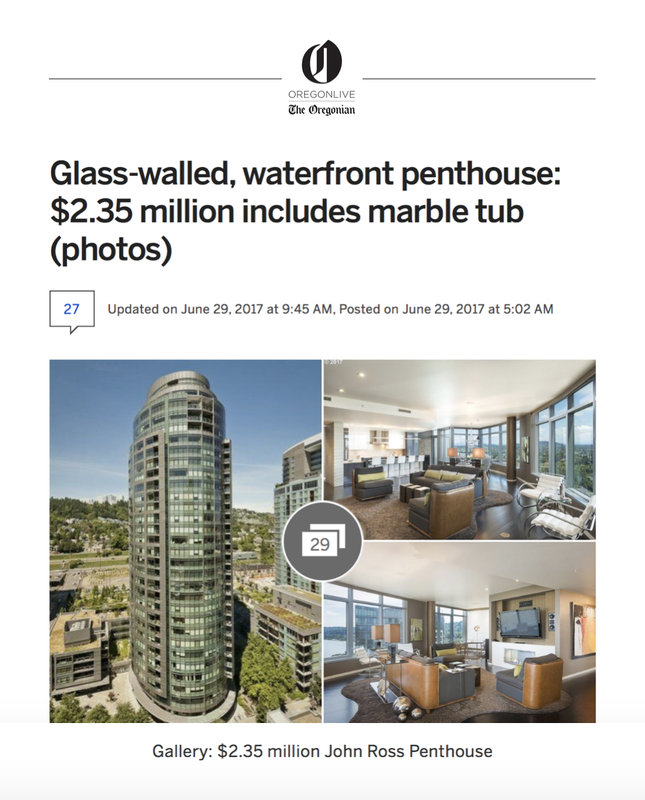 The owner bought the condo in Portland’s South Waterfront in 2010 for $692,000, according to public records, and added custom stonework and finishes. Standout features include smart-tech systems, custom Italian marble and a steam shower in one of the 2.5 baths. The single-level, 2,698-square-foot condo has two bedrooms, two fireplaces and a terrace that extends the entertainment space. The rock-bottom price in 2010 was typical in the real estate downturn of the recent recession, long before the Portland area climbed to near the top of elevating U.S. home prices. Back then, Portland was hit harder than just about anywhere else in the world, according to a study by the Brookings Institution and the London School of Economics. Study author Alan Berube dubbed Portland one of the “housing-bubble metros,” places where an over-reliance on the residential real estate industry made it particularly vulnerable when the sector crashed. In 2005, the builders of the John Ross tower epitomized Portland’s condo craze when would-be buyers reserved 80 percent of the tower’s units in six days. The John Ross was named for a British naval officer who explored the unsettled Northwest. But nothing else about the structure was out of the past. Energy-efficient construction and features earned the modern building LEED-certified (Leadership in Energy and Environmental Design) status. Despite the early hoopla, by the time the John Ross was completed in 2007, the world had changed. Banks began tightening lending standards, making it harder for buyers to get mortgages. Investors that helped drive demand withdrew. About 77 of those 225 would-be sales fell apart. And soon, the condo market was flooded with competition. As of March 2010, 80 units were empty and without buyers, and 50 were on the auction block in April 2010, some at a 70 percent discount from the original asking price. While many high-rise homes’ views have been blocked by newer construction, the penthouses at the top of the John Ross building continue to have unobstructed vistas, which accounts for the differences in value and prices. The tower’s topmost penthouse, which is not for sale, occupies the entire floor, which allows for a full 360-degree view. Owners pay about $1,300 a month for homeowners association expenses such as 24/7 concierge service as well as communal hangouts like a lounge with a kitchen, fitness center, outdoor barbecue area and 5th-floor deck overlooking a 2-acre park. Annual taxes at #2905 are $18,689.